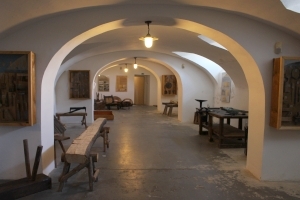 Museum exposition Building the Kačina Chateau uses information gained from archive research and acquaints visitors with the building of the chateau in 1806–1823. This exposition includes not only archive materials of the period, i.e. mainly plans, budgets, and correspondence related to the construction, but using museum collections also the individual crafts that were needed for the chateau to be built, from diggers and bricklayers all the way to locksmiths and joiners. Media partners: Český rozhlas 2 – DVOJKA, Český rozhlas – REGINA, GASTRO HOTEL profi revue, Kam po Česku, Kutnohorský deník, Myslivost, PRESSWEB, Obzory Kutnohorska, REVUE 50plus and Zemědělec.